The two images on the left of the milk cartons were painted in my final year at art school in 1998, lamenting the fact that two of my paintings (one, a pink painting of a boxer dog called Morgan and the second, an oddly shaped canvas depicting an abstracted Martin Puryear sculpture) 'disappeared' from my studio the previous year. I'm not too cut up about it, despite the fact that I hope whoever took those paintings suffers an eye-gouging from the painting falling off the wall, or something similar and as effective. Anyway, I just thought it interesting that almost exactly 10 years later, I painted two milk cartons on 'Travelling May Induce Calcium Deficiency', 2008, oil on canvas, 1000mm x 800mm. Our friend Kendra has recently headed back to the USA. 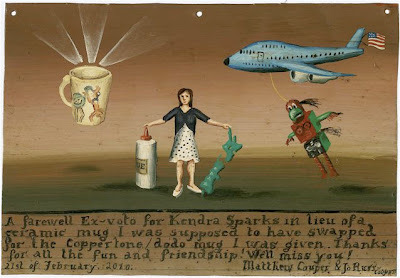 I painted this ex-voto for her departure, mostly because I was supposed to make Kendra a mug to swap the one she made for me. I'll post images of Kendra's mug soon. You can visit Kendra's blog here.